Okay, I know the title of this post sounds a little harsh. I just wanted to get your attention. After all, I don’t really want you to suffer! And suffering is what this post is all about. Or rather – how to end suffering – by allowing suffering. What, you say? What on Earth? How can you end suffering by allowing suffering? Allow me to explain. What does he mean by this? 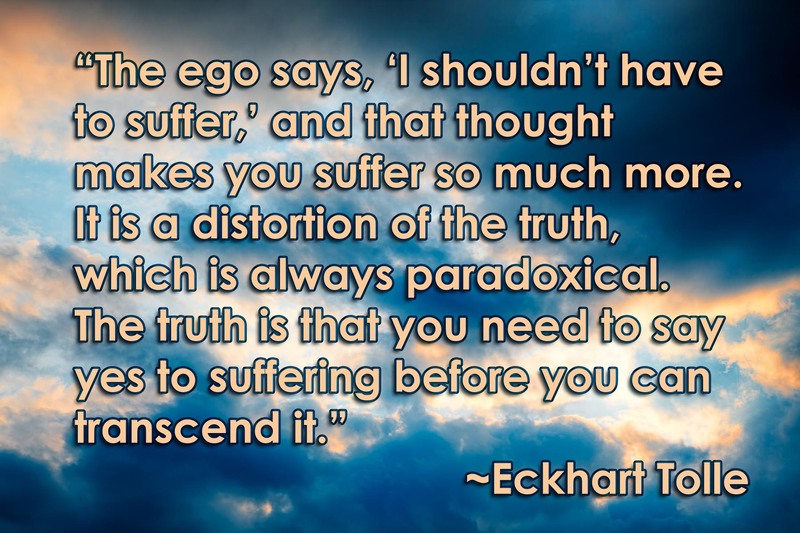 Why do we need to say yes to suffering before we can transcend it? Well because otherwise, we’re resisting suffering. And what you resist persists. What you resist, you put your power into, thus strengthening and fortifying the very thing you are resisting. And when it’s suffering that you resist, you make the suffering even stronger, more real, more powerful, and for even longer a time. Allowing yourself to feel vulnerable to suffering is to let go the illusion of control, and it’s one of the hardest things we can ever do in our lives. If you let yourself feel vulnerable, you might have to feel all that pain you’ve been suppressing and denying and resisting, and that’s one of our most primal fears – even more than physical pain: emotional pain. Instead, why don’t you just let go of the illusion that you have control of anything outside yourself? Stop trying to push back and fight back and play tug-of-war with a world that is nothing more than the reflections of your own projections. Stop trying to protect yourself from suffering, for when you do that, you build up dark, dense walls around your Heart. Your Heart is where you project from – so while you’re so busy keeping the pain out, you are also blocking your own light off from projecting a happier outer reality for yourself, projecting instead through filters built from the bricks and blocks of suffering. 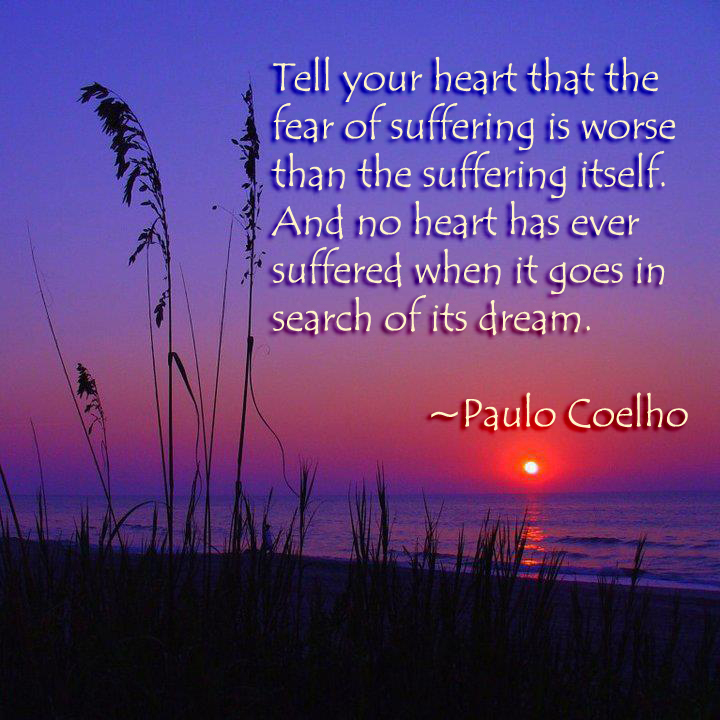 Let yourself feel vulnerable to feeling pain and suffering. The sooner you do, the sooner you give up the struggle, the sooner you realize that all that suffering is simply an illusion that you made up and turned into the big scary boogieman that was never even chasing you in the first place, but rather was simply trying to get your attention so that you could address the fear and let it out. When suffering comes knocking at your door, understand that it’s not there to attack you. It’s there begging you to let it go. All you have to do is say yes. Allow it. Forgive it. Let it be okay. Get out of the past traumas and dramas, and stop worrying about the future. Simply be Present, right here, right now, and let yourself let go. Face your fears head-on by looking them right in the face. You’ll find that the suffering you’ve been so worried about has been nothing more than the fear of facing the pain you’ve tried so hard to suppress. And once you let yourself face it and feel it, you realize you’re still here, you’re still okay, and that it actually felt really good to face the pain and let it out… and that once you do, it’s no longer there building up like a pressure cooker, because once you said ‘yes’ to the suffering, you released all that steam and felt much better. Increase Psychic Perception with Ajna ORMUS - Spiritual YUM! Want Alkaline Water? Try Prills!